A wheatpaste by Morley. Photo by Stefan Kloo. Does social media or submitting artwork to blogs pay off monetarily? It’s difficult to say for sure. There are stories of people who have spent thousands of dollars buying art based on an online recommendation or who bought works after they were highlighted on a blog, but many galleries rely heavily on existing client lists and word of mouth rather than online press. Jaime Rojo and Steven Harrington of Brooklyn Street Art say, “We know for a fact that we have assisted many artists to get more opportunities, meet each other, meet collectors, build their practice and build an audience.” They also noted that on occasion they “have simply been ordered [to cover an artist or a particular show] by someone who regards us as employees or pawns, an extension of their marketing effort or their PR machine.” Even if some artists and gallerists like to pretend the masses on the internet do not matter as much as their client lists, many of them still reach out with commands or incentives to attract an audience. While the ways in which bloggers help artists is often private or indirect, I know of two stories with a direct line between blog coverage and a paycheck. The first concerns Los Angeles street artist Morley. On June 2nd, 2011, The Outsiders (Lazarides Gallery’s print and small works shop based in London, UK) launched a series of four prints with Morley. This was his first print release. Morley went to London to put up outdoor work for the occasion. Compared to many of the other artists with whom The Outsiders work (David Choe, Bast, Ron English), Morley was and is a small fish, and his rise from being an obscure poster artist in LA to showing his work at a major gallery in London took only a few months. How was that possible? The internet, of course. 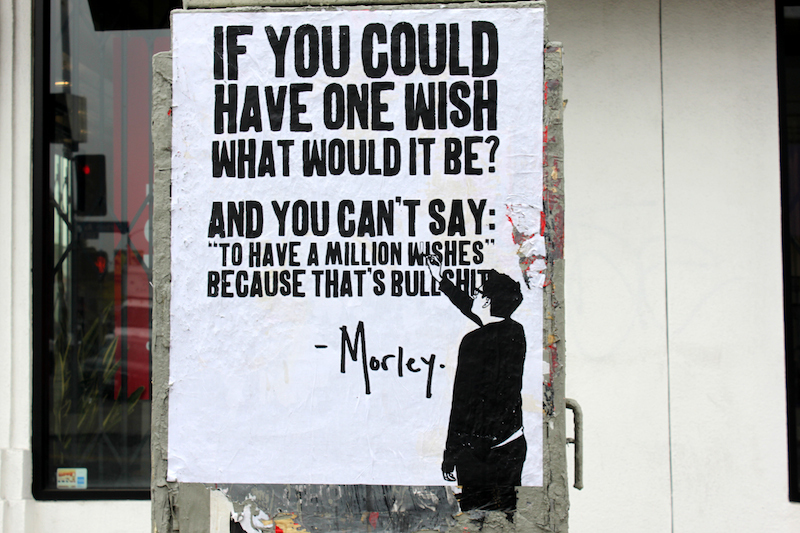 The earliest mention of Morley I can find on any blog is from Melrose&Fairfax on January 16th, 2011, shortly after Morley’s first posters appeared on the streets of Los Angeles. That speed isn’t surprising, since Gregory Linton, the man behind Melrose&Fairfax, was going out almost daily at that time to take photos of street art in LA, and his favorite spots to photograph have become well-known. Linton seems to like more street art than he dislikes, given how much he was posting to Melrose&Fairfax with a positive review. Melrose&Fairfax continued to post about Morley’s work consistently and Morley has established a solid outdoor presence in LA. A few days following the initial post on Melrose&Fairfax, Morley’s work was posted on Vandalog for the first time. Whereas Linton at Melrose&Fairfax initially came across Morley’s work on the street with no information about the artist, Morley sent me an email alerting me to his website and I reposted images from there. Morley went from having done no street art to being internationally-known in a matter of weeks. While a post or two on Vandalog or Melrose&Fairfax is no guarantee of fame or commercial success, Morley’s case shows that it is possible. In an interview with Stephanie Keller for Vandalog, Morley explained that The Outsiders contacted him “out of the blue” with an offer to work together. Many on the staff at Lazarides have stated they read Vandalog regularly, and they likely follow Melrose&Fairfax as well. Morley had never put out posters outside of LA and hasn’t been written about in Artforum, but the staff at The Outsiders saw his work somewhere, most likely online, and liked it enough to want to work with him. Why is Morley’s story is different from the Australian artists who do not seem to have his same luck? Previously I argued that street artists should travel first and then use an online presence to maintain the fanbase developed through travel. Morley successfully reversed the order. Morley simply reached out to Vandalog, produced art that works very well in a photographic image, and someone at Lazarides saw the work and believed it had commercial potential. Much of the content for Vandalog and many other street art blogs comes through the editors’ inboxes. There are some artists whose work I like even though I have never seen it in person. Of those artists, some are active in cities or towns where they are the only significant street artist or graffiti writer. Some email me their new work whenever they want to share it to an audience beyond their immediate geographic community. That Morley was active in LA is irrelevant. He could have been in Arizona with Yote or Ohio with Vinchen or the Navajo Nation with Chip Thomas aka Jetsonorama or Valencia with Escif and Hyuro. He sent me an email, the work piqued my interest, and I wrote a post about it. If Morley were not in LA (so his work would not have ended up on Melrose&Fairfax) and he had not sent out emails to blogs like Vandalog, he might still be anonymous. Email isn’t the only solution (Instagram, Flickr, Tumblr, etc. are potential alternatives), but is a way to politely and directly reach out to people in a way that social media is not. Another example of the influence of the online press for street art is the story of Joshua Allen Harris, recounted by Marc and Sara Schiller of Wooster Collective. The Schillers posted Harris’ work to Wooster Collective in March 2008 after a woman they met at a dinner party showed them a photo of one of Harris’ sculptures. It was an “air bear,” a little animal made out of plastic bags and attached to a subway grate so that it would inflate with air when a train passed beneath it and deflate to look like trash when there was no air flowing up through the grate. The woman had seen the sculpture on the street the night before, but had little knowledge of street art. She showed the work to the Schillers because she thought they might find it interesting. They loved the piece, and they asked if they could upload her photos to Wooster Collective. The post was an instant hit, yet the artist behind the air bear was a mystery. Harris was alerted to the post and reached out to the Schillers. Harris wasn’t out to be the next big street artist and he’d never heard of Wooster Collective. The animal was done for a class project at the School of Visual Arts. When Harris saw its success, he continued to produce similar work and began to send videos of his inflatable animals to the Schillers, who posted those as well. Eventually, Harris was interviewed by New York Magazine and commissioned to make a sculpture for a Sesame Street segment. A simple and mysterious post on Wooster Collective led to Harris taking his work in a completely unanticipated direction for a huge audience. While the Marc says that he and Sara have never considered themselves as gatekeepers in the street art world and he points out that he and Sara don’t force anybody to like anything or buy anything or put artists into certain gallery shows or mural festivals, it seems clear that they have significant influence. Not getting your work posted to Wooster Collective isn’t going to kill your career and so in that sense they and other bloggers are not true gatekeepers, but a couple of posts sure can help. Arrested Motion’s Tanley Wong shares Marc’s discomfort with being labeled a gatekeeper or potentially influencing people’s art purchases, something artists and collectors have told him he has done. On the one hand, Wong wants to give exposure to artists who might otherwise be ignored and support the artists he loves. He fears that if he does not share the art he loves with a wider audience, the artists making that work may stop producing art due to lack of encouragement or the financial means to continue. Wong doesn’t want his favorite artists to be forced to choose between making art and getting a day job to support their families. “My job is to share the art that I like so that I can keep seeing new art that I’ll like,” he says. On the other hand, Wong says he didn’t initially intend to make people buy anything. He worries that readers might take him too seriously sometimes, either buying art on Wong’s recommendation without doing their own due diligence or ignoring an artist because of something he’s said. That’s one reason why everyone at Arrested Motion generally stays positive and avoids posting negative critiques. Wong is open about his background. He is a knowledgeable fan, but not a professional art journalist. He doesn’t try to be or expect to be treated as any more than that. Like many art bloggers, Wong is a superfan with a commitment to sharing what he loves.